If the bulk of your site’s organic search traffic comes from people searching for variations on your company name, congratulations! You’ve got name recognition — people either know you, have heard about you, or your existing customers are looking to find you again. But what about people who haven’t heard of you? What about people looking for a product that you (and your competitors) sell? If your business is looking to attract new customers, then attention needs to be given to those keywords and keyword phrases that describe what you do and what you sell. What we’re talking about here is branded vs. non-branded keywords. Let’s say I’ve got a company called ZamWhoop Manufacturing here in Canton, Ohio. My main product: whoopie cushions. 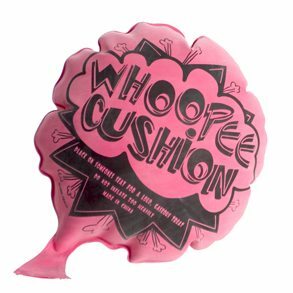 We’ve got the loudest most obnoxious self-inflating whoopie cushion in the market. If I look at my site statics in Google Analytics, I note that 90% of my traffic is coming from variations of the keyword ‘ZamWhoop’….’ZamWhoop Mfg’, ‘ZampWhop’ (misspelled), ‘ZamWhoopie’, etc. The key here is search volume. If 100 people a day search for ‘ZamWhoop’ and 100,000 people a day search for ‘whoopie cushion’ — well, it makes sense to try and rank better for the descriptive, high volume keyword. Right? The website above has received 7,110 visitors from organic search. 3644 (51%) of those visits were from 322 keyword variations on the Brand. Which of those 1,441 non-branded keywords should we be working to exploit further in order to attract new customers to our enterprise? Which of these keywords have the greatest volume of people searching for them? Which of those keywords have the least amount of people competing for them? Which of these keywords — if you executed a focused content management strategy — would allow you to grow your business this year? My point is this – if most of your site’s traffic is coming form ‘branded’ keywords, you’re missing out on opportunities to attract new customers. So rather than simply looking at the total keywords you ‘RANK’ for, please (please, please) invest some time in assessing keywords that should be sending traffic your way.